A North Yorkshire artisan spirit company is celebrating after its strawberry vodka liqueur was awarded a prestigious gold star at the Guild of Fine Food’s Great Taste Awards. Ripon based The Little Red Berry Company has built on the success of its 2015 Great Taste star for Blackcurrant Vodka Liqueur with a second coveted star at the annual food awards that are dubbed the ‘Oscars of the food world’. 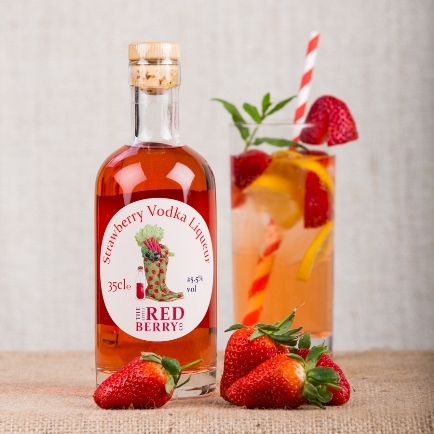 Rachel Jamieson, who founded The Little Red Berry Company in 2011, said: “We are thrilled and proud that the judges loved our Strawberry Vodka Liqueur as much as we do! We have used Spilman’s of Sessay near Thirsk for our Yorkshire Grown Strawberries since we started The Little Red Berry Company. Former events manager Rachel and her husband, Rob, used to make Raspberry Gin and Sloe Gin for friends and were inspired to start The Little Red Berry Company by their love of food and drink and a desire to build a business producing spectacular spirits using Yorkshire grown fruit. Rachel now runs the artisan company with help from Rob and a growing team who now produce approximately 18,000 bottles of liqueurs and gins in small batches by hand every year.